Augusto Giacometti (Swiss, 1877-1947), Untitled (Abstraction), watercolor and graphite on paper, 10 April 1923. With permission © Christie’s Images Limited (2017). I had the privilege of working with Erica on a rather complicated and challenging donation being submitted to the Canadian Cultural Property Export Review Board. Our museum had received a large donation of Indigenous objects with little provenance and uncertain cultural identification. Erica was thorough, helpful, professional and generous with her time. Her support and guidance throughout the process was invaluable. Her final report was thorough, well-researched and comprehensive. She was able to identify the artist for two Inuit sculptures through her close professional networks. Her professionalism, approachability, patience and meticulous research make me very confident in recommending Erica and her services to both individuals and cultural institutions. Curator of Indigenous Art, Recognized Canadian Art Museum (2018). Erica’s professional assistance with two recent appraisal projects for works of indigenous Canadian art was invaluable. Her connoisseurship, attention to detail, methodology and professionalism illuminated all the critical elements of the project to a result we felt confident was credible. It’s a pleasure to work with a colleague like Erica, who is accessible, and reports her results with clarity and precision. Cindy Charleston Rosenberg, ISA CAPP, Past President and Certified Member of the International Society of Appraisers and Chair of the ISA Specialty and Advanced Studies Committee (2018). Erica a accepté promptement l’invitation… de s’adresser aux guides bénévoles du Musée de beaux-arts du Canada pour aborder… la question de l’évaluation des œuvres d’art, aspect qui est souvent abordé par les visiteurs du Musée, mais qui est très délicat intramuros. Les guides se sentaient mal équipés pour répondre aux questions… du public. La présentation d’Erica fut grandement appréciée de tous et toutes, à tel point que nos collègues anglophones… ont insisté pour profiter de l’éclairage, de l’expertise et de l’expérience d’Erica en cette matière. Illustrer ses propos d’exemples concrets d’œuvres qui lui ont été soumises pour évaluation pour différentes raisons : achat, vente, ou simple curiosité quant à la valeur courante du marché, a permis de mieux saisir toutes les subtilités et toutes les étapes impliquées dans le processus. Elle a partagé avec générosité et en toute humilité un cas inusité et complexe avec des implications outre-frontières et un dénuement heureux, est-il besoin d’ajouter. Francine Chabot-Plante, National Gallery of Canada Docent Lecture Series (2018). It makes a positive difference when you connect with the right appraiser, because it feels like you are working together for the best result. 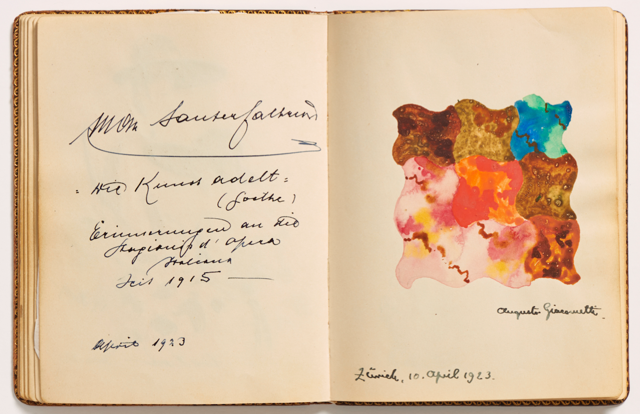 You definitely were the right appraiser for the Swiss Guest Book. We enjoyed our interactions with you, appreciated your help and support and feel like finding you was meant to be. You will remain in our book and we will happily refer you to anyone looking for a reputable appraiser! We hired Erica… to identify and appraise a large Inuit soapstone sculpture from Cape Dorset by Qaqaq (Kaka) Ashoona, ca. 1965. In meeting with Erica, I learned that she had great expertise and broad knowledge in many areas and from different cultures. She was able to furnish a detailed appraisal report very quickly, which helped us research the artist and learn more about the beautiful piece. I look forward to working with her again. I have known Erica for some 35 years but had not had the opportunity to directly work with her until recently. This woman is a powerhouse and is so gifted, positive and energetic, that I would recommend her to anyone… She knows the arts and the Indigenous field as well. She is one of the most amazing people I could ever recommend… she delivers professional results with the highest integrity. John McAvity, CEO, Canadian Museums Association (2017). A few years ago, I was making a donation… of paintings from my collection and required an appraisal… Erica came highly recommended to me from a friend… who was a former colleague of hers. It was a pleasure meeting Erica; she is a consummate professional and very personable. After inspecting and documenting the pieces in person, she prepared a timely and well-written appraisal report that she had thoroughly researched. I have used Erica’s appraisal services since… and will continue to when required. I recommend Erica to anyone requiring a knowledgeable and well-respected expert in this field. Donna Stainfield, Client (2013, 2016). Erica Claus appraised the value of some works of art related to a family estate. Her considerable knowledge, experience and thorough research on the pieces gave me, as an estate trustee, confidence that we had an expert and impartial estimate of their fair market value. I would highly recommend Erica’s services – she is comprehensive, professional, reasonably priced, genuinely interested in her work and empathic about the challenges involved in settling an estate. Mary Ellen Chown, Client (2016). Erica’s expertise and contacts within the Canadian art community were invaluable in helping find the ideal solution for one of the most important and biggest paintings in my collection. I was downsizing and considering making a donation of one of my larger pieces, but I didn’t know where to start. Erica made it easy…after appraising the piece, she gave me several contacts that quickly and painlessly led to a… new home for this lovely piece of Canadian art. I can’t thank Erica enough, I learned a lot in the process and it’s gratifying to know that this painting is being viewed and appreciated today by an entirely new and larger audience. Erica Claus treated our inquiry and our painting with highly professional skill and respect. Erica gave us expert advice about its value and its future needs in terms of conservation. We enjoyed the appraisal process where we learned much about the history of our painting, which is a family heirloom, and about Norval Morrisseau. I think its resurfacing is one of these truly lucky, by-chance encounters, because it promises to shed new light on this part of Schadow’s production and the history of Düsseldorf painting. Cordula Grewe, Art Historian, Associate (2014). My brother and I were extremely impressed with the extensive knowledge, professionalism and thoroughness of Erica Claus and Associates in the appraisal of our portrait. They provided us with valuable historical data, patiently answered all our questions, shared their expertise and respectfully advised us on how to restore and care for this irreplaceable work of art. As executor of an estate, I retained Erica Claus to appraise the work of Betty Sutherland (Layton, Boschka). This was a challenging assignment since Sutherland is relatively unknown today, despite having been recognized by leading artists in Montreal as a painter who expressed a broad humanity and disturbing imagery, mostly active in the 70s-80s. Erica produced an appraisal report which provided excellent context for the work and she found a comparable artist to whom she could refer in coming up with a market value. The report was very well researched, documented and written, and proved fascinating reading. Her high degree of professionalism, combined with her respectful and easy personality made it comfortable to have her in our home. I highly recommend her and her services. A cross-Canada move required I insure my artwork. A search took me to the ‘International Society of Appraisers’ and to Erica Claus. I wasn’t sure which of the paintings I had inherited needed appraisals. Erica came to my home, examined the Canadian paintings carefully, and shortly thereafter sent me a preliminary report which helped me decide. Erica’s personal interest and expertise in the area meant I received a very detailed report on both the artists and their work. I was impressed by her professionalism and personal interest the works and their stories.